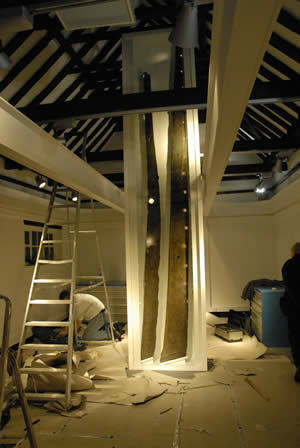 These huge oak side-rudders, more than a thousand years old, date from the time of the Viking invasions of East Anglia in the ninth and early tenth centuries. 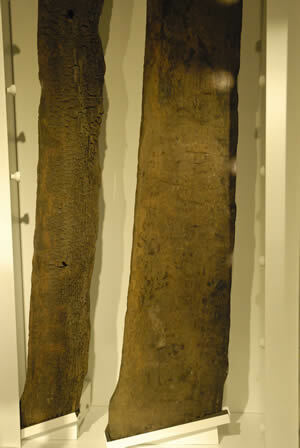 The longer rudder (over 4 metres tall) is the biggest and best-preserved example yet found from the Viking era. It would have steered an exceptionally large ship. The smaller rudder was trawled up off Southwold by 'Dinks' Cooper in 1981. The larger one was washed ashore during a storm in 1986 and found on the beach at Easton Bavents by 'Nobby' Hutton. Both were conserved by the National Maritime Museum at Greenwich. They have been radio-carbon dated between 850 and 950 AD. No remnants were found of the original vessels. These massive rudders or steering oars may have come from the ocean-going long-ships that brought Viking raiders to Suffolk or from high-sided cargo vessels. In either case the boats would have been clinker-built, pointed at both ends and longer than Southwold Museum. Because of their pointed sterns, Viking vessels were guided by a steering oar (styrisbord) fixed towards the rear of the right-hand side - hence the modern word 'Starboard'. When moored in a harbour they were tied to the quay on the left to avoid damaging the rudder - hence the modern word 'port'. The rectangular holes nearest the tops of the rudders held tiller bars. If the helmsman pushed forward on the tiller, the ship would turn to port (left) and pulling back would make it turn to starboard (right). The rectangular holes lower down, just above the rudder blades, contained iron fittings for attachment to the pivot on the side of the ship. All the Viking Age rudders found in Scandinavia have round holes for attaching them with rope but sailing trials with replica ships have shown that rope is dangerously weak. The Southwold rudders seem to have been better designed. At the very top, one rudder has a peg and the other has a notch to hold a control line to prevent the rudder blade from being pushed backwards by the flow of the water when sailing. There are also small holes through the blades for lifting lines. 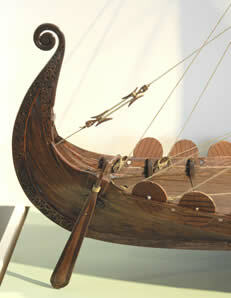 The right side of a ship is named 'starboard' from the Anglo-Saxon word for a rudder – ‘steer-board’. When the ship was in port it would be the left side that would lie alongside the quay, so as to avoid damaging the rudder. That's why that side is still called the 'port' side.